Following up on last week's review of Jean-Charles Brosseau’s Thé Brun, today I’ll be reviewing Fruit de Bois, another of the fragrances in the Collection Homme released by Brosseau last year. With notes of bergamot, grapefruit, sage, geranium, nutmeg, vetiver, cedar, sandalwood, juniper and amber, this one could easily have been mistaken for a Serge Lutens. The bois in question here, and clearly the star of this show, is cedar. The scent opens with a faint though not unpleasant zest of grapefruit and juniper paired with earthy nutmeg and vetiver. These notes form a kind of veil over the cedar, preventing it from being too one-dimensional. From here, the cedar takes center stage as the warmer basenotes begin to open. Though the amber and sandalwood envelop the cedar, adding a slightly sweet edge, the bitterness of the cedar resurfaces every now and then. I’ll be honest, I’m not a huge fan of cedar due to the sometimes camphorous, body odor note that can accompany this blonde wood. That note is sadly present here which prevents me from totally falling for Fruit de Bois, but I will say that this is one of the easiest-to-like cedar scents to come along in a while (one of my favorite cedars is Yves Rocher Blue Cedre, if that gives you any idea as to what I find permissible regarding camphor-ish b.o. notes). Like its companion, Thé Brun, Fruit de Bois quickly relaxes and stays close to the skin with good longevity but minimal sillage. Reminding me of Serge Lutens' Bois et Fruits, though more like the lighthearted summer version than a full-on Serge creation, this is definitely a scent for those who love cedar. Personally, I would have liked a stronger fruit note in this composition — the grapefruit just doesn’t carry enough of a punch — something deeper and sweeter, allowing the cedar to take a supporting role, but we don’t always get what we want, now do we? 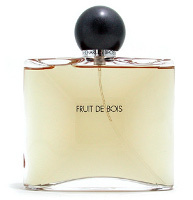 Testers of Fruit de Bois are available for under $25 at parfum1; the fragrance is also available at perfumebay and at escentual in the UK. Marlen strikes again! Cedar? Body odor? Could be mistaken for a Serge Lutens? Oh my, I must have this. Camphorish BO? Hmm, I've never gotten that from cedar. Must be different chemistry – SL works great on me, fortunately no BO! Must try this Brosseau.